Former captain Paul Lambert has expressed both praise and sympathy for Celtic manager Ronny Deila. The Norwegian led Celtic to a league and cup double last term, his debut season in Glasgow, and his team top the Premiership in the current campaign. But he has been criticised after two defeats by Molde in the Europa League. "I think he's done a great job with what he's got to go with but it takes a special player to play with Rangers or Celtic," Lambert told BBC Scotland. "Even in my own time, we had a team full of men who could handle 60,000 (fans) every week and great teams coming to Parkhead and us giving them a game. "One thing I know about Celtic is it has not got time to blood people into games. The fans will not accept it domestically or in European terms. You have to hit the ground running. "Looking at the team at the minute, if the club's philosophy is to bring in young guys you have to come out and tell the public that. "But I'll guarantee you, if a young player is not good enough and (a manager's) job is at stake, he is not going to play him. "The fans want to see you winning. The fans want to see Barcelona coming and you winning." In the Europa League, Celtic appear to be missing the composure of last season's stand-out defenders, Virgil van Dijk and Jason Denayer, who are no longer at the club. While 18-year-old Kieran Tierney has been lauded for his performances since becoming a more regular fixture in the Celtic back line this term, Lambert feels the left-back is the exception. And the former Borussia Dortmund midfielder believes the challenge for young players such as Stuart Armstrong and Scott Allan, who were signed from Dundee United and Hibernian respectively, is to adapt to the heightened expectation of the Celtic supporters. 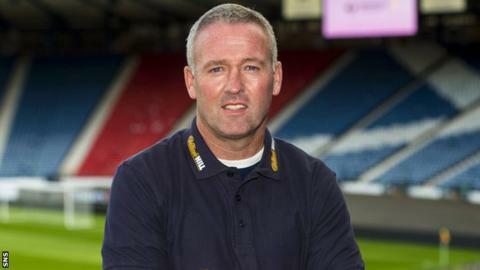 "I watched the young lad (Tyler) Blackett the other night - he looked so petrified," said the ex-Scotland international, who won four league titles with Celtic in his eight-year career there from 1997. "Every time he had the ball he looked as if he had a mistake in him. You thought, 'the game is too big for him'. "It's great being a player at Dundee United, Motherwell or Hibs and you look great, but you throw them into that Old Firm environment and there are 60,000 absolutely demanding that you win a game of football. "You've got to be so strong in the head to handle 60,000 criticising you or praising you." Another factor Lambert feels is contributing to Celtic's struggles in Europe - they are bottom of Europa League Group A - is the lack of a domestic title challenge. "The worst thing ever to happen was Rangers getting demoted. It took the competition away and made Scottish football a mockery," he said. "Scottish football is suffering without Rangers playing against Celtic. "I'll guarantee if Rangers came up, you'd get a lot better standard of player coming to this country to play."